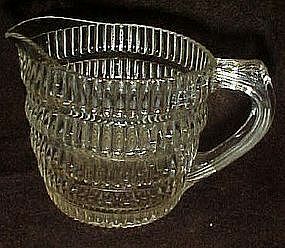 Nice depression crystal pressed glass creamer. Not sure of the maker or pattern name. No markings found on the glass. The pattern consists of vertical ribbing that is in tiers top to bottom. 3 3/4" at the pour spout. Beautiful piece. No flaws, mint condition-no disoloration.